This story is reprinted from the website of the Rye Sustainability Committee. Balloons are generally associated with fun and festivity. However, balloons have a dark side, as they can cause power outages and pose a serious threat to wildlife and the environment. They’re also an eyesore, marring the landscape of our beautiful communities. Released balloons ultimately return to the earth as litter, with many ending up permanently clogging and polluting our waterways and oceans. As a coastal community, Rye (and Pelham) are part of an ecosystem that is particularly sensitive to the effects of released balloons. Balloons are available in two varieties – latex and Mylar. Mylar balloons are made from mylar nylon, a material developed for use in the U.S. space program. They are not biodegradable and are often coated with a metallic finish. Their durability means that Mylar balloons that land in the ocean remain forever. As they drift, they become part of the ever-accumulating hordes of permanent trash that we find in and around Long Island Sound – and beyond. Their shiny quality also makes them particularly susceptible to being mistaken for food by marine animals. I JUST WANT TO HAVE FUN! ARE THERE ALTERNATIVES TO BALLOONS? The good news is that the party, parade, or real estate open house can still go on without the balloons. There are a wide variety of fun, colorful, and eco-friendly alternatives to balloons, including reusable paper streamers, flags, banners, and even bubbles. December 12, 2018 – Speaking to the crowd gathered at a workshop entitled “Confronting Climate Change: What To Expect In Our Region,” County Executive George Latimer announced the creation of a Climate Crisis Task Force tackling actions needed to reduce Westchester’s carbon footprint and make us more resilient to climate change. Steered by Sustainability and Energy Conservation Director Peter McCartt, the Task Force led by Janet Harckham, Beth Sauerhaft and Anjali Sauthoff will be creating short-term action initiatives the County can take, while in parallel working on an updated long-term Climate Action Plan. Both of these moves will help shape Westchester’s climate future both now and going forward. Expanding electronic vehicle infrastructure, creating a network of charging stations across the county. Installing 30,000 LED bulbs County-wide that maximizes energy savings and lowers the cost of maintenance of lighting. Please Sign the Letter Below to encourage our BOE and Elected Officials that Sustainability is necessary as we build our schools and community for the future! See link Below. Add your name in the comments below or email lmjoyce888@gmail.com. I am sending this on behalf of a group of Pelham residents. Please see our letter attached. We would greatly appreciate if you would share the letter with the New Hutchinson School Committee members, and with the new Hutchinson School design team. We are writing to urge the Board of Education to ensure that the new Hutchinson Elementary School building is designed and built as a modern, sustainable, and energy efficient facility that meets, at a minimum, LEED Gold or equivalent standards. We were unable to attend last night’s community meeting, but hope to attend and discuss at the upcoming September 25th BOE meeting. 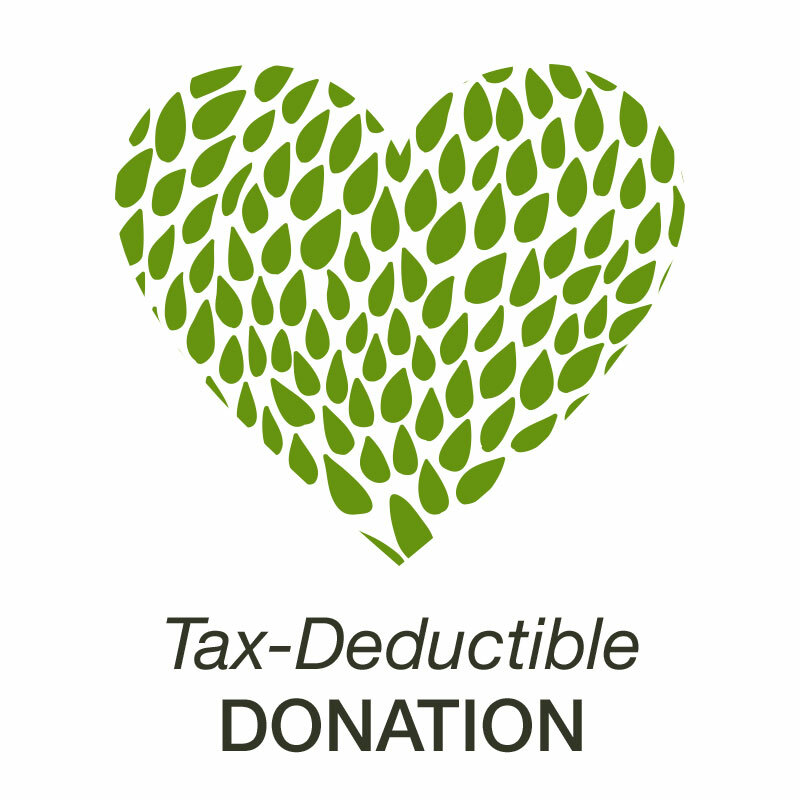 As citizens of the Town of Pelham and parents of children attending school in the Pelham School District, we believe that the District has a once in a generation opportunity to demonstrate its commitment, to students and the community, by doing its part to maintain a healthy environment and to address the increasingly urgent climate change and sustainability crisis. We urge the Board to aim for a net-zero emissions design which also moves the district toward a zero-waste future, eliminating waste from the cafeteria by including dishwashers to enable reusable dishes and utensils, as well as food scrap composting. We believe it is critically important that the District participate in the sustainability revolution. Doing so would not only allow the District to “walk the walk” in teaching our students environmental values; it would instill in them the pride in knowing that we can work together to address environmental problems. It would also save money — because minimizing energy usage reduces energy bills. The new Hutchinson Elementary School will operate for the next 100 years. Our hope is that it will stand as a testament to the environmentally, educationally, and economically sound thinking of the current members of the Board of Education. We urge you to think outside the box, to set an example for future building projects, to tap into all the support and resources available to Pelham through NYSERDA and other programs such as the Zero Energy Accelerator Program, and to strive to preserve the best future for our children by building a green, sustainable, Hutchinson Elementary School. We look forward to continued discussion on the new Hutchinson Elementary School building and how best to ensure a healthy environment and sustainable future for Pelham’s children. The scale of the problem is enormous, but it’s not a lost cause. Just like when your dentist says you can avoid further problems with your gums if you brush better and floss often, a change in how we live could be the catalyst for cleaner oceans in the future. Read on to learn about the true scope of the issue, why plastics in our oceans are such a problem, why we at itsafishthing.com are so concerned, and why you should be too. We’ll finish by looking at some of the methods currently in use for ocean cleanup, what the future may hold, and what you and I can do to help put the brakes on plastic pollution. Where Does All the Plastic In the Ocean Come From? What Impact Does Plastic Have On the Oceans? What Happens To All The Plastic Taken Out of the Ocean? We Are All At Fault. We Are All Responsible. We Can All Make A Difference. 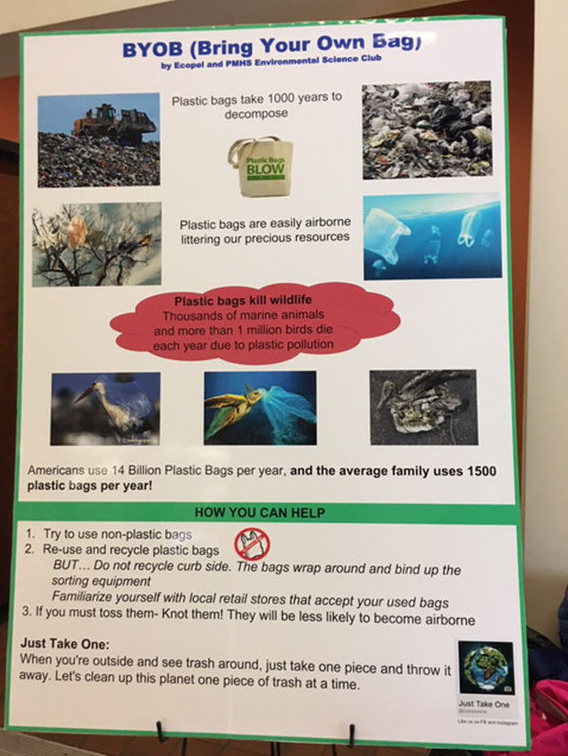 PMHS senior Megan Ploch, head of PMHS Enviro Club, created the poster below emphasizing a new definition of BYOB—Bring Your Own Bag (A Reuseable Bag, Rather Than a Plastic Bag). The PMHS Enviro Club was among the sponsors of a free screening of “A Plastic Ocean” at The Picture House on Earth Day (April 22). More than 100 people of all ages attended the screening of the documentary which chronicles the effects of plastic in the ocean. The film showed animals mistaking plastic for food and dying as a result or eaten by sea animals that make their way into the food chain—and into humans. From beautiful images of blue whales swimming to devastating stories of oceanfront communities living in washed-up plastic waste to natural ways to clean plastic from waterways, the documentary informed as well as tugged on the audience’s emotions. 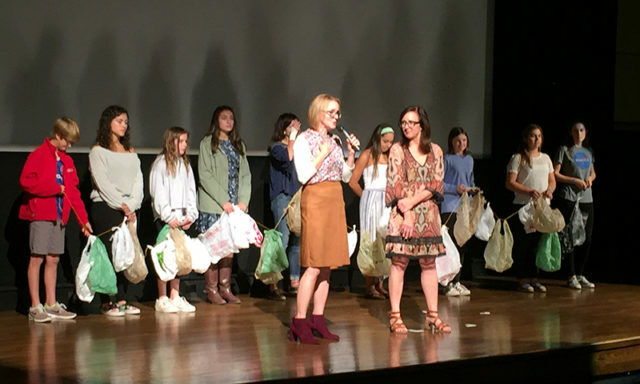 EcoPel, in conjunction with Meridian Risk, Joan Solimine Real Estate, and the PMHS Enviro Club, handed out free reusable totes to highlight the simple way that Pelhamites can make a difference by shunning single use plastic bags and replacing them with reusable ones. EcoPel thanks The Picture House, The PMHS Enviro Club, and ConEd for co-sponsoring the screening. He reflects back and thanks mentors like coach Ed Witz and his dad for getting him where he is today. Heintz is undecided as of now as to where he’s going to college next year and what he’ll study. Athletic accomplishment: Heintz had 30 goals and 30 assists for 63 points in 26 games to help the Pelicans lead to the programs first ever state championship. During the final four weekend, Heintz had two goals and an assist in the state semifinals 6-0 win. He garnered second team all-state and was named to the final four all tournament team. He also garnered all-league and all section honors. He was the tournament MVP of the Beektown tournament earlier in the season. He was the USPHL (US Premier Hockey League) player of the week during the season. Heintz was the captain of the hockey team this past season. He’s been a member of the lacrosse team for the last three years. Academic accomplishment: Heintz has a 95.06 GPA. He’s undecided as to where he’s going to school next year and what he’ll study. He’s a member of the National, Math, Italian, Science and English honor societies, and Rho Kappa Honor Society. After school, Heintz is a member of the Italian Club and the EcoPel Program (Environmental Safety Club). In the community, Heintz has volunteered his time with Room to Read, a USA Hokey Level 2 Referee, Coast to Coast, and Relay for Life. Heintz has a summer internship at Rockefeller University. In his spare time, Heintz kayaks, plays golf and tennis, does Yoga, and reads. The Journal News: A few weeks removed now has it sunk in yet that you and your teammates won the first state title in program history? Nathaniel Heintz: It started to sink in a little more over the past few days you know once we got back to Pelham and everybody said congrats. Now we’re getting into lacrosse season, we’re working towards hopefully winning a section title this year. It’s awesome, we’ve been talking with coach and there’s been a lot of talk amongst ourselves and it’s starting to sink in a little more, I’m not sure if it’s fully sunk in yet though. TJN: Is there anything you can take from your experience during the hockey season and transfer it into the upcoming lacrosse season? NH: A lot of the dedication that goes into it is the same. Both of them are team sports and there are a lot of guys who play both so it’s important for both teams that we got to be close knit and that was a big part of our success — the way everyone backed each other up. TJN: Describe the moment you knew the team was going to win and the moment when the horn blew and the win became official. NH: I think once Stef (Stefan Miklakos) scored that second goal and we sort of got out in front, that was a pretty big one to get but once we got that fourth goal, with like 10 minutes to go, I think that’s when I thought we had it. When the buzzer sounded, it was unbelievable. All the hard work we put in our whole lives is incredible to do it especially for coach Witz. He dedicated most of his life to the program, building it up. All the fans came up – there were probably 100 kids up in Buffalo, our families, and all our teammates that worked so hard together to get where we were and no matter how much anyone played, they gave it their all. It was awesome to see everyone’s hard work mean something. TJN: How long have you been playing hockey? NH: My dad was a big hockey player so I think I was always around it. I started skating when I was three but I didn’t start playing till I was five. I started doing the clinic and we built a rink in my backyard. He taught me to skate and shoot out there. TJN: When you get to college, are you going to continue playing either sport? NH: I want to play club hockey in college because I was thinking about taking a gap year because that’s what you have to do to play college hockey but I decided I wanted to go to college and focus on my academic career. Club hockey is still pretty competitive for a lot of guys who like me take academics seriously. TJN: Do you know where you’re going next year? NH: No, I haven’t decided yet. I’m still waiting to hear from 10 schools. That should happen within the next nine days or so it’s going to be a pretty packed next few days. Then I’ll have the next month to decide. Wherever I’ll end up, I’ll be happy. TJN: Do you know what you want to major in? NH: I’m not exactly sure yet. It depends on which college I get into I guess. I was thinking engineering either mechanical or biomedical because I’ve always liked to build things for the mechanical aspect. Then I think biomedical because I’ve spent the last couple of summers working at a neuro-molecular biology lab researching Parkinson’s and that was interesting. TJN: What was the one piece of community service work you’ve done that left you with a lasting impact? NH: I think the EcoPel work I’ve done. My friend’s mom started it and pretty much what it’s doing is promoting a healthy lifestyle and promoting ways to create a more sustainable environment around Pelham. EcoPel stands for Environmental Coalition of the Pelhams so, we do a lot of town cleanups and yoga solstices on the summer solstice. That’s the one that affected me the most because of how important it is nowadays with all the pollution and what not to do to have a healthy environment and healthy lifestyle. TJN: How cool is it to know you get to follow in Ben Hurd’s footsteps in winning the Con Ed award? NH: It’s awesome that we’ve got two guys in one year. It shows how special our team was I guess. Not say we’re the two best players, we’ve got 10 guys who were huge on the team even more really. To have two winners in the same year is remarkable. The Con Edison Athlete of the Week recognizes students in Westchester and Putnam schools who excel athletically. Academic achievements, leadership, citizenship, and school and community activities are also factors. The winner is selected each week by a panel of athletic directors and coaches who review ballots submitted by each athlete’s athletic director or coach.